my thanks to a friend of many years standing who I am pleased to see has overcome a challenging medical year and is still bringing his excellent research to our service into 2012 and for many years to come we must all hope. Well done, thanks & stay healthy Richard – just don’t let the heart rule the head, well at least not the valves! 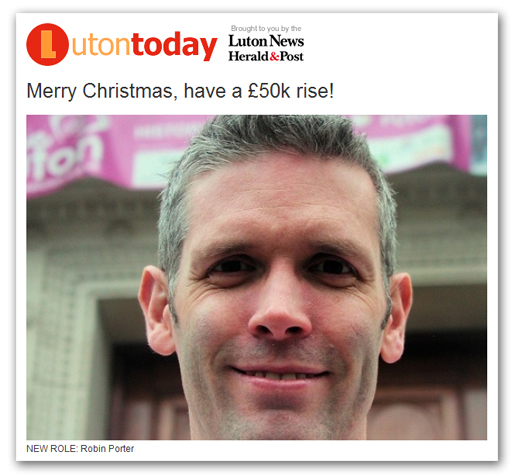 The assistant chief executive at Luton Borough Council, we are told, will receive a bumper pay rise in his Christmas stocking after cuts to the authority’s corporate directors saw him promoted. Robin Porter’s role has been merged with that of the director of customer and corporate services, Steve Heappey, after the council agreed more cuts to senior management. Securing the new “director of commercial and transformation services” post will see 38-year-old Porter’s salary rise from the current £65,000 to £72,000 range to the £111,000 to £122,000 range commanded by the council’s existing corporate directors. He is currently in charge of the council’s cost-cutting “Luton Excellence” strategy, a role he took on after heading up the authority’s £200 million Building Schools for the Future project, which was scrapped by the government last summer. Then there is this little madam – done alright for herself in a job that was so important that the post is not to be replaced. 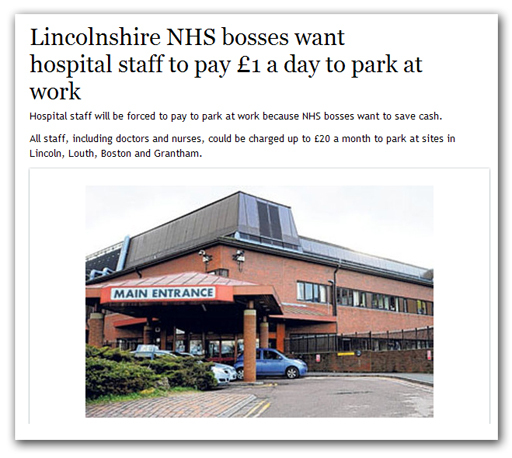 Another one of the parasite class – basically useless and grossly overpaid. Another madam sitting on her own private pot of gold is Joanna Killian who, for her money tells us “I didn’t have the greatest education, or the sort of background many would expect of a chief executive. There is that dimension which has helped me to want to be in public service and stay in the job I am doing”. She has the nerve to call her pot of gold a “calling”, despite being the best paid female chief executive in the country. God knows how much she would want if she was in it for the money, although she is an expert at taking the piss, having taken a highly publicised pay cut of £4,000 in the summer, only then to collect a £6,900 bonus and an extra £1,100 towards her pension. 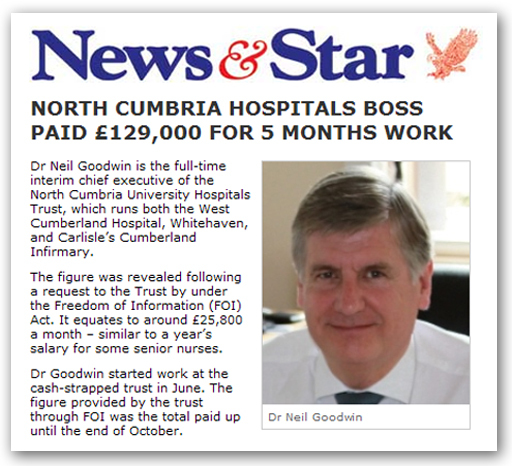 The looting is not confined to local government, of course, with the parasites just as evident in the NHS. 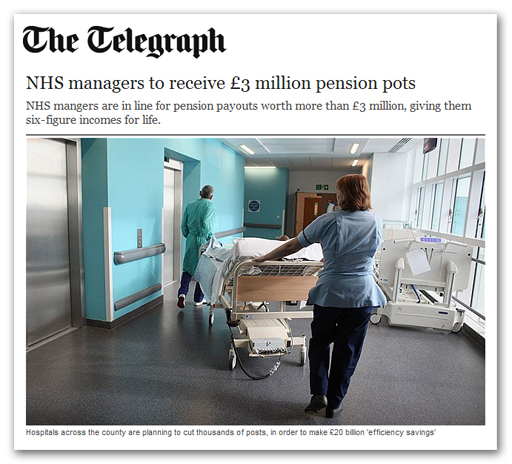 Prof Stephen Smith, who was chief executive of Imperial College Healthcare trust until September, has a pot of £3.3 million – which will pay him between £135,000 and £140,000 a year when he retires, after a lump sum of at least £405,000. Jan Filochowski, chief executive of West Hertfordshire Hospitals trust, paid £280,000 last year, will get an annual payment of between £135,000 and £140,000, on retirement, plus a lump sum of £415,000, thanks to a pot valued at more than £3 million, after 36 years in the public sector. Sir Ron Kerr, chief executive of Guys and St Thomas’ Foundation Trust, in London, will swap a salary of £254,000 a year for a pension pot of £3.06 million when he retires. Meanwhile, in order to keep the parasite class in the luxury they most definitely do not deserve, staff – many of whom earn under £20,000 a year – are being charged to go to work. As the song once went, “It’s the rich wot gets the pleasure, it’s the poor wot gets the blame”. But hey, never mind … I am sure all these gifted public servants look at their payslips and repeat the words of that nauseating television advertisement: “because I’m worth it”. 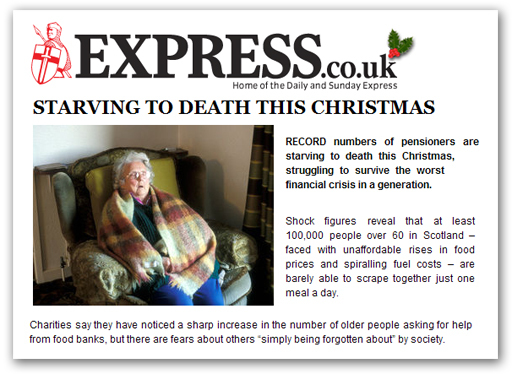 Never mind that people are actually starving in this country, while food banks are doing record business. Their needs come first. Previous Previous post: Massacre at Wounded Knee & The EU Betrayal! Next Next post: G0636* – The Predicted Demise of The EUro & Pending EU Collapse.